From custom cocktail glasses to lanterns and even craft room storage, Mason jars can be repurposed in so many ways. If you love these versatile little jars but don’t know where to start, keep reading for a round-up of must-try ideas! Few things dress up a homemade gift like Mason jars. 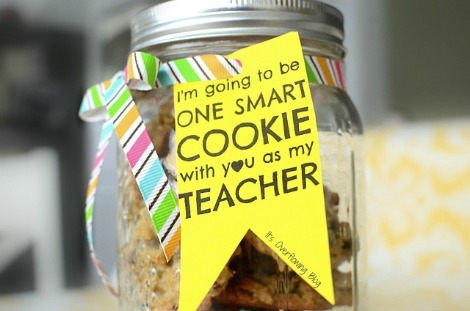 This One Smart Cookie, back-to-school teacher's gift by It's Overflowing is the perfect example of how thank you gifts look that much sweeter when they're wrapped up in Mason jars. 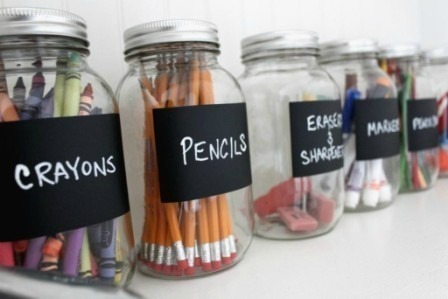 Mason jars and self-adhesive chalkboard vinyl go hand-in-hand. You can use them to do anything from customize cocktail glasses with guests' names, or label jars to keep your craft room manageable. Bradens Grace has chalkboard labels (Bradens Grace, $6) in dozens of sizes and shapes. All you have to do is peel the labels and stick! 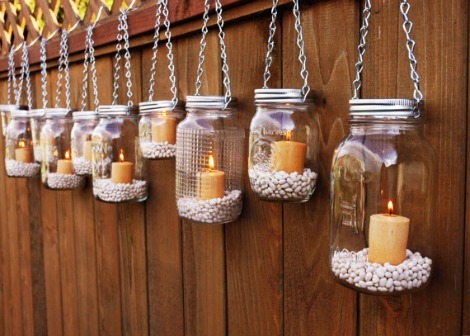 Just add a votive candle, sand or pebbles, and you have a sweet little Mason jar lantern. If you'd like a hanging lantern, simply drill small holes on the side of your lid, thread a chain through the holes, screw the lid onto your Mason jar and hang the lantern. Of course, if power tools aren't your forte, you can always grab some of these premade hanger lids (The Country Barrel, $24). You just need a Mason jar with a lid, a soap dispenser pump and either a drill, or a hammer and nail. 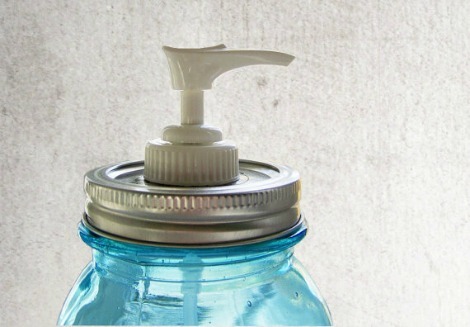 Simply punch a hole in the lid (either by hammering the nail through until you have a hole wide enough to accommodate the soap dispenser, or drill a hole in the top), fill the jar with liquid soap, twist the lid on and stick the dispenser pump through the top. Of course, you could always skip the legwork and buy the lid and pump preassembled (The Country Barrel, $7), then spend your time decorating your jar (like tinting it blue to replicate antique glass). For this look (Live.Mom.Work. 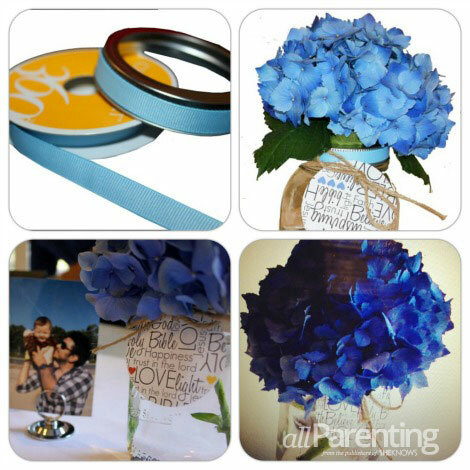 ), all you need is a Mason jar, a hot glue gun, ribbon, twine and tags (if you'd like). I just popped the center top out of the lid, then used the hot glue to line the outside of the rim with ribbon. Next, I tied the tag onto the jar with the twine and set the flowers in. It's super simple, but it's a great way to make a statement on your tables and tie in your event theme. Mason jars are perfect for organizing all the little things in your life. 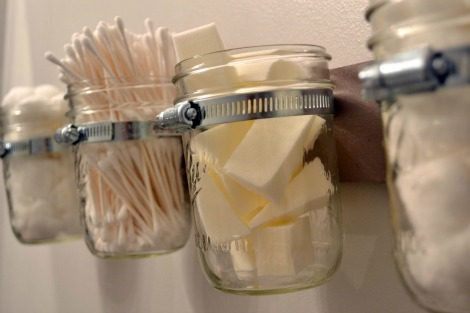 This Mason jar bathroom storage rack is adorable and easy to make. You just need a wooden board, Mason jars, picture frame hangers and large pipe clamps. Affix the pipe clamps to the board, nail the board to the wall and set your Mason jars in the clamps. You can find the complete tutorial on Liz Marie Blog.